Kids love to sing worship songs and Hillsong are a leader in writing and producing songs that children will understand and learn easily. This DVD is divided into 3 episodes each with 4 or more songs on the themes of Prayer, the Word, and His House. Follow You is the fifth live album from Hillsong Kids and now you can experience twice the fun with this new DVD! The DVD has all of the 13 super songs from the CD, but now you can watch them instead of just listening to them! Each song has a recorded video performance of the artist singing their much loved track. These music videos will have every child laughing, dancing and singing as they are encouraged to become more devoted to Jesus. The DVD brings children straight into the action of the songs and makes them feel like they are there with the Hillsong Kids performers. Follow You encourages children everywhere to join in and worship Jesus with passion. There are 3 episodes on the DVD, which all feature live worship songs, music videos, memory verses, interactive teaching and hilarious sketches. Follow You DVD by Hillsong Kids was published by Kingsway in January 2011 and is our 12913th best seller. 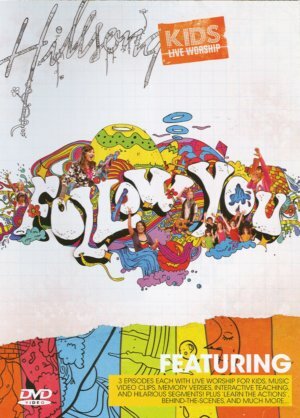 The ISBN for Follow You DVD is 9320428098153. Kids Worship at it's best! We used this in the 6 - 9 age, of our annual convention and the children loved it. It takes time to get to know the actions, but it's far better than an aerobic workout. Take it all and Spinning Around, are favourites of ours. Got a question? No problem! Just click here to ask us about Follow You DVD. A:The Hillsong DVDs are region free, and so should be fine to play on players anywhere. Thank you for using the Q&A Forum. .
A:Thanks for your question about Follow You DVD. The publishers recommend this DVD as suitable for ages 4 to 12. However, it will probably work best with the 6 to 9 or 10 age group. There is a video clip on the page dedicated to the item which will help you decide if the DVD is right for your young people. Yours, . Are the words for the songs displayed on the screen at the same time as the children sing? A:This DVD features subtitles. Once activated the lyrics will appear on the bottom of the screen enabling children to sing along with the music.